Since it can be pretty hard to get four people together for a whole day to play a tabletop RPG, at JADE we like have to have a few back up campaigns. These "One-Off's" fill the need for an RPG adventure without excluding some one from the main campaign adventure: currently Interstellar Exports. We already had one of these One-Off games in my Ivershill Campaign, but we needed more to keep things interesting. 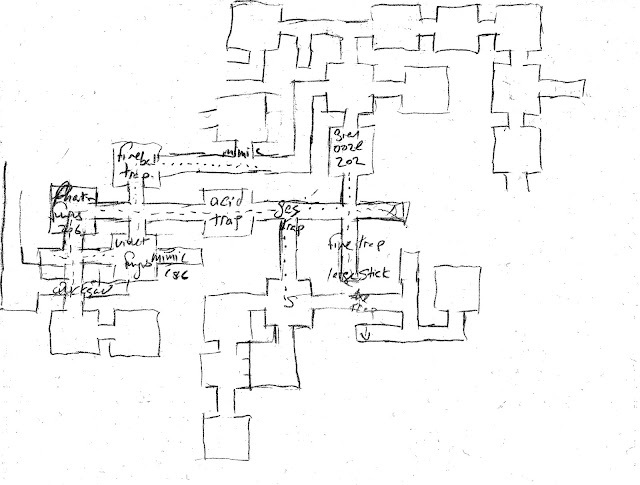 So, Elijah came up with an idea for a random dungeon crawl, that he dubbed the Dungeon Grind Campaign. Using D&D 3.5 we would create 5th level characters and then get thrown into a dungeon with no equipment and only the most basic of supplies. The map for the first Dungeon Grind was created using this Map Generating d12. 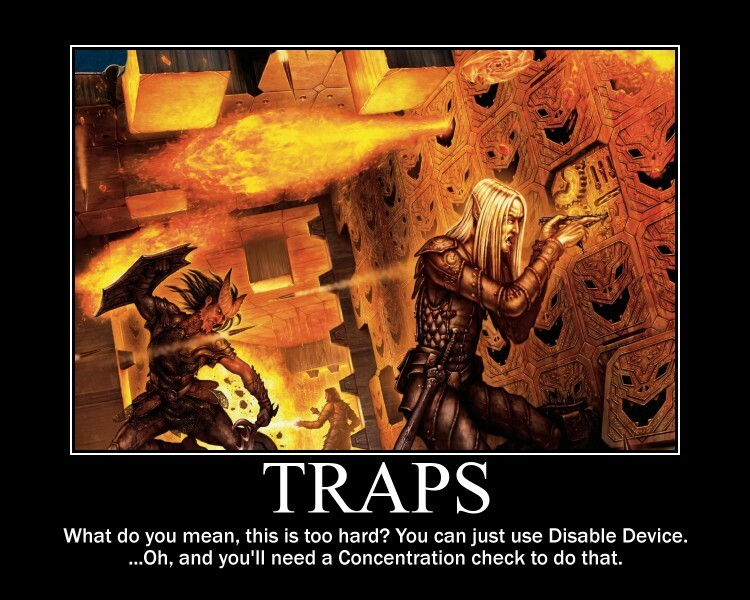 As well, any the traps we encountered was generator using the Trap Generating D12. He rolled the dice a few times to build a bit of a start for the dungeon, and then took the time to look up some monsters. While he was doing that,Dave and i created our characters, he was playing a Monk named Sean Josef and I chose a Paladin named Sir Reginald Grinsby. With our characters made he threw us straight us into the dungeon! We awoke in the centre of room with 4 ways out. We watched as a terrified human ran down the Easterly corridor only to be splattered apart by a trap of swinging mechanical axes. In the corner sat a dwarf, eating the glowing blue mushrooms form the walls. 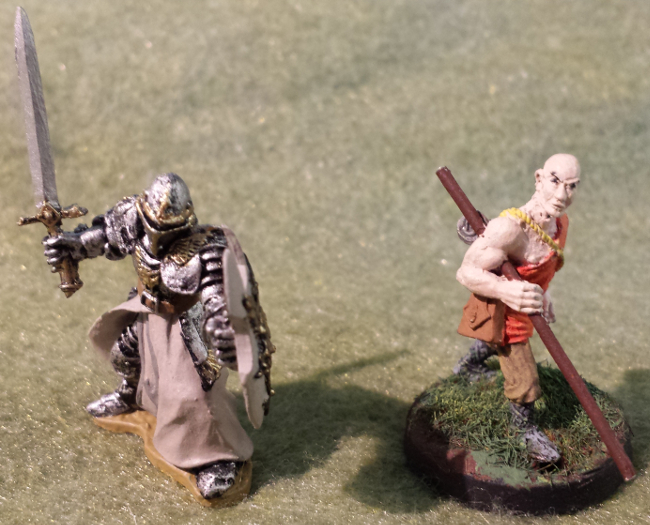 He turned out to be quite mad and of no use, so the Paladin and Monk agreed to work together, and leave the dwarf behind, who didn't wish to join us any ways. As the two explored the tunnels, they were battered by gas traps, fireball traps and quicksand traps. Not being thieves, dealing with these traps was almost impossible, and the adventurers would often turn back, rather then risk injury or death at the mechanical weapons. Having no weapons or gear meant that the Paladin was useless against many of the beasts. The monk with his Improved Unarmed Strikes was able to fight a bit, but mostly his assaults ended in him batter and injured, and unconscious more than once. In the end they fled from more than they faced but they did stand against several foes. 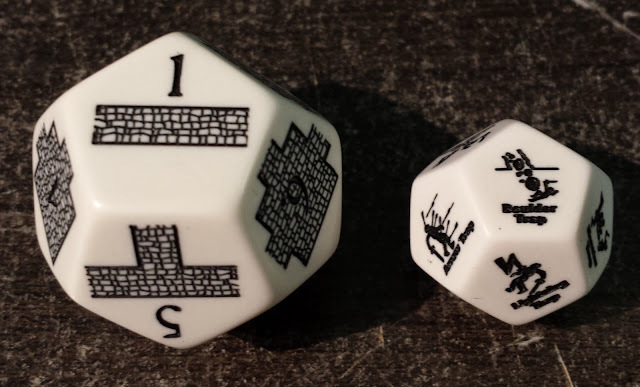 The first was a Gray Ooze (which sent them running), the second a Phantom Fungus (That they we able to slay), the third a Violet Fungus (that the Paladin threw a Mimic into) and fourth and fifth were two Mimics. Though they fought boldly, in the end they were taken down by a deceitful Mimic. It disguised itself as a closed door, and struck as the Paladin listened through the key hole. Caught off guard both he and the Monk fell to creature. As a player I was genuinely surprised! I thought we had finally found a store room of some kind. So when it turned out to be a mimic I was too close to react! Should have known better. It was an awesome and gruelling adventure and I look forward to running through it again in the future! Well done Elijah!